Mushrooms are having a moment. They’re now in lots of different coffees. And for some, the idea sounds pretty unappetizing and maybe even revolting. But the mushroom coffee trend is going strong. The question is, Why? Is mushroom coffee something you should be drinking and is it better for you than a regular cup of Joe? Here’s everything you need to know about trendy mushroom coffee. Mushroom coffee is made by first liquifying medicinal mushrooms and then drying their key constituents. Then, these isolated parts are ground up into a powder. Mushroom coffee is powdered, regular coffee plus these powdered, medicinal mushrooms. It’s a soluble beverage that actually has a smooth, earthy, and warm taste. All you do is pour the packet into your favorite mug, add hot water, and enjoy. The mushrooms used in coffee aren’t the psychedelic type, so don’t worry – you won’t be tripping anytime soon. Instead, the mushroom varieties in coffee are said to provide amazing health benefits. Traditional Chinese Medicine has been using medicinal mushrooms for thousands of years to address various health complaints. Modern research shows that medicinal mushrooms can increase immune function, reduce blood pressure, fight cancer, reduce cholesterol, enhance cognitive function, and reduce anxiety. To be clear, though, there haven’t been many research studies examining the health benefits of medicinal mushrooms on human subjects. And a lot of the studies that have been done haven’t been replicated yet. So, the research is limited, but still growing. What are the health benefits of combining medical mushrooms with coffee? Let’s take a look at some of the most common fungi that show up in coffee. Remember, many of the listed health benefits are attributed benefits of medicinal mushrooms. In some cases, there is research to back these health claims. Contains antioxidant properties, which help to fight free radicals and prevent oxidative stress and damage. These properties become increasingly relevant as we age, especially since they help to fight against chronic diseases, such as cancer, heart disease, and neurological diseases, like Alzheimer’s and Parkinson’s disease. Rich in polysaccharides, which act as prebiotics inside the digestive system. This, in turn, boosts digestion, metabolism, weight, blood glucose levels, and so much more. May help prevent cancer. Chaga mushrooms have been noted to have antitumor and anti-cancer properties. In fact, one study found that chaga mushroom properties can stall colon cancer cell growth. Be aware that chaga mushrooms have a blood-thinning effect and should be avoided before surgery. They may also interact with blood thinning medication and blood pressure medication. Rich in adaptogens, which support liver function and help the body to detox, as this study found. For individuals with an autoimmune disease (psoriasis, celiac disease, lupus, rheumatoid arthritis, Type 1 diabetes, etc. ), mushroom coffee might be a problem. The reason for this is because mushroom coffee may boost immune function activity. This may actually increase the immune system’s actions and create more discomfort for individuals with an autoimmune disease. If you have an autoimmune disease, it’s best to do your own research about mushroom coffee and how it may affect your current condition. The biggest, and most obvious, the difference between mushroom coffee and regular coffee is that with the latter, you just get coffee, without the benefits of medicinal mushrooms. Regular coffee benefits include providing powerful antioxidants, increasing alertness, improving mood, supporting cardiovascular health, and more. 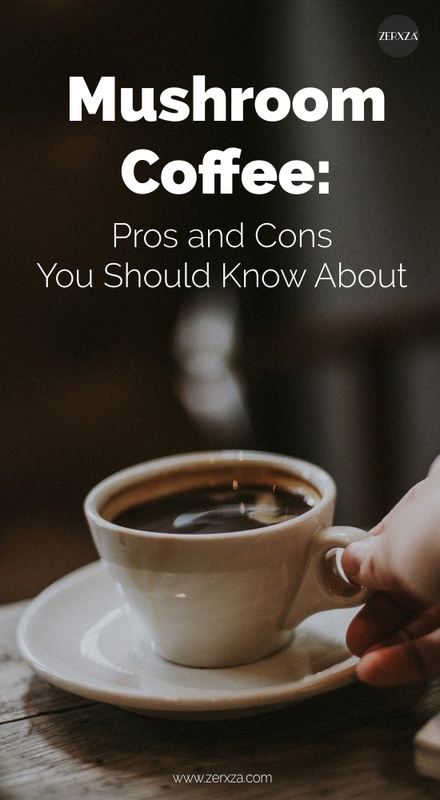 Regular coffee tends to have a significantly higher amount of caffeine. However since mushroom coffee is made with half coffee and half mushroom, it tends to have a lower amount of caffeine. This is great news if you’re sensitive to caffeine. With mushroom coffee, you still get to enjoy this quintessential beverage, without all of caffeine’s negative effects, like jitters, increased feelings of anxiety, etc. If you’re curious about mushroom coffee and want to give it a go, try it! What do you have to lose? If you like it, you get to welcome a new, healthy beverage for your kitchen. If not, you can always stick to good old coffee. Mushroom coffee is certainly having its moment. It’s delicious, easy and is said to boost overall health and wellness. Are you on board?